My blogging pal JJ from The Invisible Event reminded me of this bit of wisdom only the other day after I told him that I had purchased a new Paul Halter novel. You see, my relationship with Halter’s work has been . . . eh . . . problematical from the start. I respect that he is a super fan of Golden Age mysteries, especially those of the locked room variety . . . especially the work of the Master, John Dickson Carr. And Halter certainly has amassed a body of work and a plethora of fans to show for this. Yet, I have my reservations, and a recent discussion about present-day authors who attempt the Golden Age style cemented many of the reasons why. An emphasis on the puzzle over all, with certain pivotal – such as the gathering of the suspects in the drawing room at the end – firmly in place. The only problem is that these checkpoints feel a little bit wrong. Like . . . there’s too much historical jabber jammed into the plot. Or . . . the characters are either too cardboard, or a modern sensibility creeps into their way of thinking or acting. Worst of all, the puzzle that is the focus of the novel . . . is just not that good. I found these flaws when I read my first half dozen Halter novels. Oh, The Demon of Dartmoor contained great atmosphere, but it was way too crammed with parallel storylines and multiple supernatural characters vying for the top red herring. I enjoyed a lot about Death Invites You, clearly my favorite so far, but I ran into the worst flaw of all: I spotted the killer the moment that they appeared on the scene. This happens every time I read Halter. To me, it suggests a weakness in the ability to misdirect, partly because the desire to offer an homage to the classic detective writers trumps true craft of one’s own. My memory for old mysteries is long, and I remember the tricks. I don’t want to see them inserted whole hog into a new mystery. I need variation and fresh takes on classic ideas. So why revisit Halter? Well, October was a rough month for me, work-wise, with very little time for reading. The one novel I tried to tackle was Sophie Hannah’s second Poirot curiosity, and I had to put it down. So the next thing I read was going to be better no matter what it was! And, honestly, I want to like Halter! I really respect the opinions of the people who do. So I gave the guy another shot. And – for three quarters of the way through, at least – things turned out better than I could have hoped. The Tiger’s Head (1991) smoothly mixes the elements of an impossible crime with the ambiance of a British village mystery. It is, if you will, a mixture of Carr and Christie, my two favorite mystery authors. Only in the final stretch, as the revelations begin, does the plot falter and let me down. Halter is fond of structuring his novels around parallel, yet apparently unrelated, circumstances and slowly connecting them together. This connection doesn’t always work for me, feeling forced and artificial. I mentioned The Demon of Dartmoor (1993) above, where there are too many threads to try and ravel into one scheme: more than one series of crimes, spread over generations, and multiple supernatural myths all crowd unnaturally together. It shakes out fine in the end, but it has a “kitchen sink” feeling that lessens the whole effect for this reader. While there are two seemingly distinct criminal plots at the start of The Tiger’s Head, the way they are woven together in the prose is rendered really well. In fact, the first sixty-five pages of this novel are the best Halter I’ve read. Dr. Alan Twist, one of the author’s two regular detectives, has returned to London from a Riviera vacation to assist in tracking down a serial butcher known as “The Suitcase Killer” who kills prostitutes, cuts off their arms and legs, sews the limbs up and stuffs them in suitcases which are then found in a variety of inconvenient places. There are echoes, of course, to the infamous Jack the Ripper murder spree of years ago, an unsolved case that continues to fascinate the good Doctor. Meanwhile, in an alternate narrative, we meet some of the inhabitants of the village of Leadenham, who are enduring their own trials, including a rash of unusual and increasingly bold thefts and a growing influx of strangers to the community. Add to this the fact that the first bloody suitcase was found in the Leadenham train station, and it is abundantly clear that the alternating chapters will ultimately merge. Of course, the stains are blood, proof that the cane has caused more than one injury or death in past days. More intriguing is the legend, borne out by the Major himself, that if one rubs the bronze head, he will unleash a genie of great destructive power. Yeah, I know, who’s going to believe in a genie? Nobody does, obviously, until the genie does appear, murders one man and nearly kills another in a room locked on the inside and guarded at every entrance by a different witness. (See picture of map below, glorious recaptured on my new iPhone 7!) The mythology is just as credible – or incredible? – as the vampires in Carr’s The Three Coffins and He Who Whispers or the werewolf in Noel Vindry’s The Howling Beast. (At least, I assume it’s a werewolf! That book is winging its way to me from England as we speak, and I’m trying not to read too much about it in advance, per instructions!) We all know that the solution to an impossible crime mystery always debunks the supernatural, but the fun lies in letting yourself get carried away by the atmosphere, confident that the actual human agency behind these ill doings will eventually be revealed and all so-called “supernatural” elements logically explained. At least, you hope they will be . . .
Halter does a fine job building suspense around both the London killing spree and the events leading up to the Leadenham killing. Hurst and Twist arrive in the village to solve the murder, having good reason to believe that the solution will lead them to the serial killer. And for a while, Halter plays with the reader in delicious ways, switching suspicion of the killer’s identity among the eight or so suspects with great dexterity. 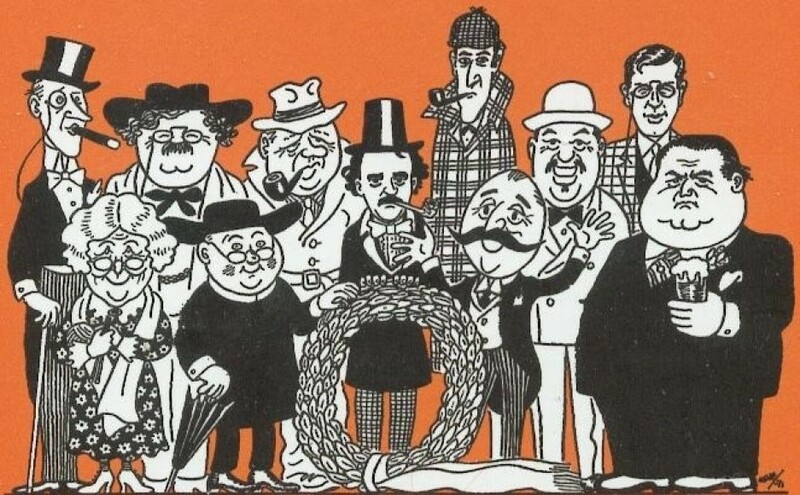 He dangles the possibility that most of these characters could be mad, and he incorporates many of the tropes of classic detective fiction that I enjoy, such as the detective’s confederate saying something in all innocence that completely gives the game away for the detective, the gathering of the suspects, and the double bluff at the end. If only he could have sustained the quality I found in the first half all the way through. Those “classic tropes” I just mentioned don’t work quite as well here. In terms of the central impossible crime, I confess that I can rarely follow these explanations, and this one was no different. However, even I felt that it was rather weak. There are actually two locked room mysteries here, and I actually loved the explanation of the second one. Not only was it clever (and I could follow it), but it fit in beautifully with previously introduced elements particular to this tale. Finally, the closing scene really bothered me because Halter made Dr. Twist do something that seemed so unnecessary and contemptuous of his friendship with Inspector Hurst – one of the best aspects of these books – that it made me angry. To sum up, the first two thirds of the novel were well worth my time, and the translation by John Pugmire felt especially smooth. In the end, however, The Tiger’s Head includes those things that irritate me about the author: his overt passion for Golden Age detective fiction is clear, but the line between homage and outright stealing of classic ideas is blurry. Plus, in putting his deepest efforts into the “howdunit” aspects of the novel, he gives away his hand as to the “whodunit” all too easily. I wonder if I will like the next one better . . . and I wonder if I should just keep that to myself? I know exactly what you mean, Brad, about debating whether to try an author again after s/he has disappointed you. That’s happened to me, too. I’m glad you found more things to like with this go-round, and I’l be interested to know what you think of the next Halter you read. If it’s any consolation, I don’t disagree with you about Halter’s Who’s — a lot of the time (not always…see The Picture from the Past) it’s clearer than one would necessarily choose to spot the guilty party; for what it’s worth, I spotted the guilty party here soon after the genie manifestation on account of a very specific piece of information you provide above. And the final scene…yeah, it’s an odd one. I mean, there’s an obvious inference, otherwise why include it, but at the same time [SPOILERS OF SORTS] just because Twist has knowledge of that thing, doesn’t mean he was involved in it — he may know what he is denying knowing, and not be telling Hurst purely because of his own personal feelings on the matter, not necessarily to hide his involvement; it doesn’t really sit with his character (which, yes, ain’t Halter’s metier) for him to have had a direct hand in things [END SORT OF SPOILERS]. I got the impression that the next Halter you were trying out would be ‘Photo from the Past’, which I enjoyed and thought was one of his stronger works. Sorry to hear that ‘Tiger’s Head’ was a let-down right at the end. I’ve been holding back from reading it as I only have three titles left to go. It was going to be, JFW, but The Book Depository was having a sale on The Tiger’s Head. PftP is the next up if you all think it’s a strong entry. So can I take it from both of you that I might be more satisfied with the “who” element of Picture from the Past? I’m afraid I didn’t read closely the parts of your review you marked out with ‘spoiler’ warnings, so I’m not sure if you would prefer ‘Picture from the Past’ in terms of choice of culprit. But for me it was one of the stronger entries, and I think I liked it just about as much as I liked ‘Death Invites You’. 🙂 If I recall correctly, I was able to guess much of ‘Death Invites You’ in advance of its conclusion, but was less able to do so concerning ‘Photo from the Past’T. hen again, I liked ‘Seventh Hypothesis’ best of all, and if I recall correctly you weren’t enamoured by it. Halter is very uneven, and I agree with most of what you say – the air of pastiche, the obvious murderers, the puzzle and nothing but the puzzle attitude, the sour endings. The Halter I enjoyed the most, and would recommend unreservedly, is La 7ème hypothèse (translated into English as “The Seventh Hypothesis”).